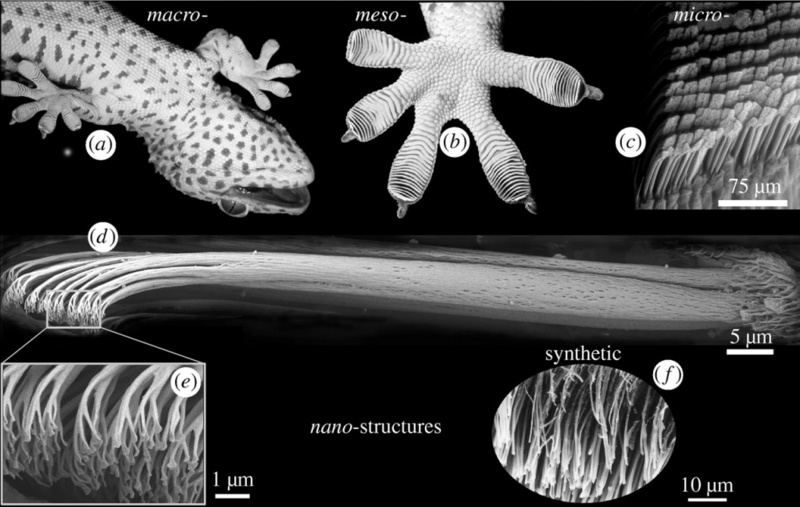 A diagram showing the structures that allow geckos to stick to walls and easily unstick themselves. On Tuesday, NASA is sending another round of experiments to the International Space Station, including a new type of adhesive developed in Southern California and based on how geckos cling to walls and ceilings. It’s a sticky pad called the Gecko Gripper, and it could help solve a perennial problem in space. Tapes and glues dry out almost instantly in the icy vacuum outside Earth's atmosphere, and since there’s no air, suction cups don’t work either. Velcro is great, and NASA has used it since the Apollo days, but it can wear out, that fabric can leave bits of debris and it needs to be applied to two sides to work. So, NASA’s Jet Propulsion Laboratory is looking for a new way to make things stick, and researchers may have found it in a material that mimics how geckos clings to walls. 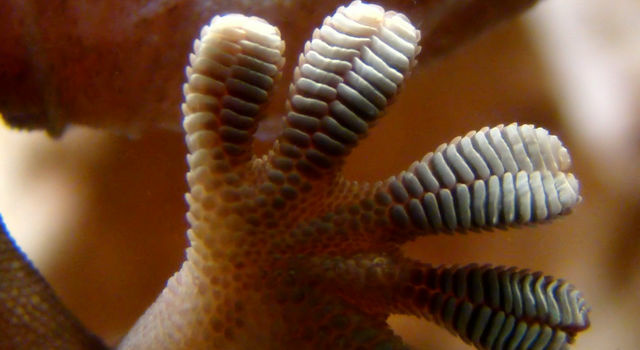 These Gecko Grippers are covered with tiny hairs that create attractions between the electron clouds of atoms. This subtle stickiness is called the Van Der Walls force and it works even in space. It's small, but if applied across enough of a surface, it can add up to something quite strong. Eventually, these grippers could be used to send robots or even astronauts crawling around outside the space station like Spider-man. JPL engineer Aaron Parness said the pads are activated simply by laying them on a surface and pushing them forward. Pull them back and they let go. 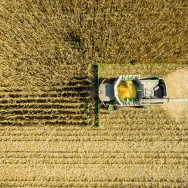 "One of the really important properties is that you can turn the stickiness on and off and the adhesive never wears out," Parness said. An image showing how Gecko Grippers can be activated and turned off by a simple motion. His team has tested the grippers about 30,000 times on Earth and after all that, they still stuck. Even duct tape can't match that. The grippers hold about a pound per square inch of material, which is decent strength on Earth, but in the gravity-free zone of space that's more than enough to hold large objects. The Gecko Grippers will launch Tuesday on board the next Orbital ATK commercial resupply flight to the International Space Station. Astronauts there will test the strength of the grippers on different materials and leave some attached inside the station for a year to see how long they can stay fastened. Photo Quiz: California or Mars — can you tell them apart?